How to get from Xian to Zhangye Danxia? Zhangye Danxia landform is located in Gansu province of western China, 917.5 km straight-line distance from Xian. It is a good choice to travel from Xian to Zhangye. Because there're multiple transport options between the two cities, including airplane, train and bus, etc. Following are several transportation means from Xian to Zhangye we've listed for your selection. The train types you can take from Xian to Zhangye include bullet train(about 7 hours), direct train(about 12 hours), air conditioning express train(about 13 hours) and fast train(about 15 hours). If you choose to take the bullet train line, the bullet trains start from Xian North Railway Station, pass Xianyang, Tianshui, Lanzhou West, Xining, and reach the Zhangye West Railway Station with beautiful sceneries. 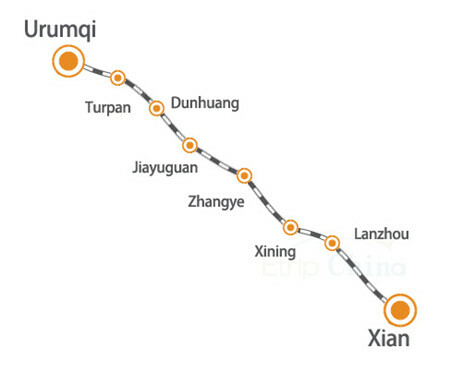 It is worth reminding that the railway line from Xian to Zhangye can be forwarded to Jiayuguan, Dunhuang and Turpan. This means that you can not only visit zhangye danxia mountains, but also get a full experience of the whole Silk Road Travel. So for this reason, the train tickets from Xian to Zhangye are quite hard to get according to our experience, thus, we kindly suggest you choose some alternative trains and seats in advance, so that your booking can be handled as early as possible. There is only one direct flight from Xian to Zhangye every day. Besides, there will be a share flight each Tuesday, Thursday and Saturday. This flight need to transfer through Lanzhou and has a total flying time of 2 h 20 min. The Zhangye airport is a nearest airport from rainbow mountains in China, so the non-stop flight from Xian to Zhangye is the best option. If you need to book discounted tickets, please feel free to contact us. Now let's have a look at Xian to Zhangye flight timetable. Q1. How far is it from Xian to Zhangye? The distance between Xian and Zhangye is 918 km. The road distance is 1137 km. Q2. What is the cheapest way to get from Xian to Zhangye? The cheapest way to get from Xian to Zhangye is to travel by train which costs $42-$46 and takes 12-15 hours. Q3. What is the fastest way to get from Xian to Zhangye? 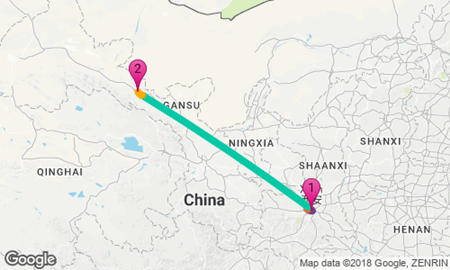 The quickest way to get from Xian to Zhangye is to fly which takes 2 h 05min and costs $80 - $180. Q4. What is the best way to get from Xian to Zhangye? If there're some good airfare price discounts, the best option is absolutely direct flights from Xian to Zhangye. And if not, choose the bullet trains. Q5. Is there a direct bus between Xian and Zhangye? No, there is no direct bus from Xian to Zhangye. Planning a Xian to Zhangye trip? We have designed the following itineraries to include the Zhangye Danxia Geopark and other highlights in and around Zhangye. They are flexible and can be customized to suit your budget and interests.